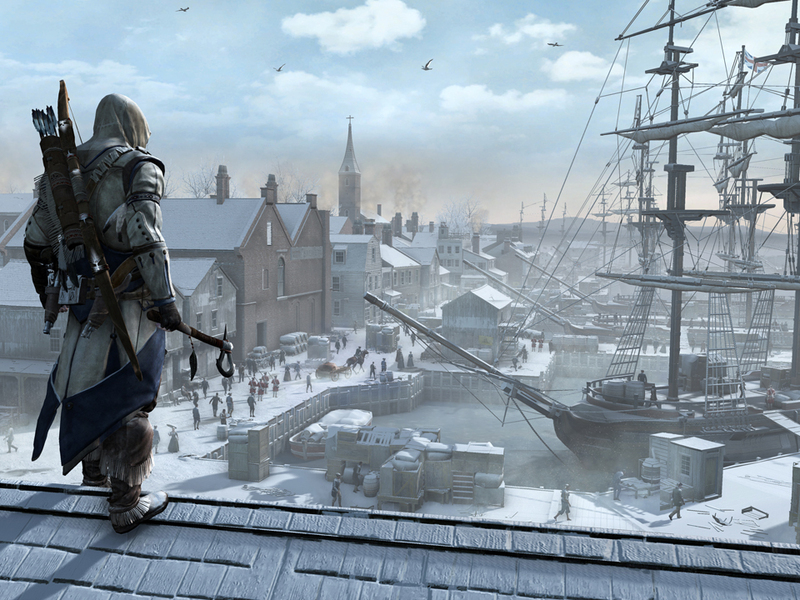 The next title we’d like to cover in our continuing PAX East coverage is Assassin’s Creed III. For this Work In Progress demonstration video, we were ushered into a room trussed up like a Revolutionary War equipment tent and plopped down on ammo crates. After watching a short intro by creative director Alex Hutchinson, we got to the good stuff. 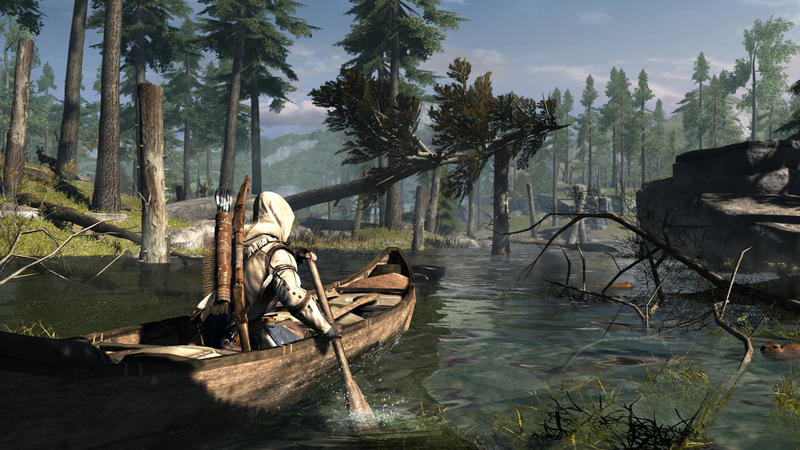 The stealth potential of the canoe, underestimate it at your peril. This time around our assassin protagonist is Connor/Ratonhaketon, a half British/half Native American during the Revolutionary War. As always, his task is to track down and eliminate Templars, who can be found on both sides of the conflict. Since doing his job will require crisscrossing the front lines of a bloody war, Connor has got a few more weapons up his sleeve. There will be Native American influences, such as the tomahawk and hunting bow, as well as nods to modern technology such as dual flintlock pistols. And contrary to internet rumor the literal trick up his sleeve – the hidden blade – is still in his arsenal and ready to be a thorn in the side of his adversaries. Some weapons on display were particularly good at showing off the new moves and gameplay available to Connor. The rope dart for example, which can be used to spear a foe and hang him from branches or rafters, is a prime example of the sort of predatory techniques you can expect to see our ‘hero’ employing. 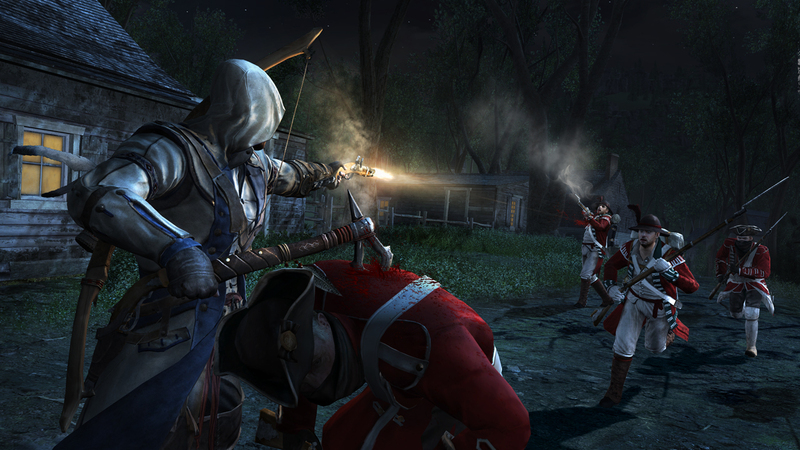 In order to facilitate these stalk-and-pounce tactics, and to take full advantage of the colonial setting, Connor’s movement system has been completely revamped. Navigation has been fine-tuned, allowing you to choose to go over, under, or through obstacles depending on the best choice for the situation. Since much of the game will be played in the wilderness, a whole new class of moves needed to be added to the already impressive navigation of urban landscapes that have thus far defined the series. Key among these moves are those relating to tree navigation. Great care was put into the design of the threes and the means of traversing them to avoid the appearance that the American wilderness is just a disguised jungle gym. You’ll run up inclined trunks, swing around them from limb to limb, and use overhead branches like monkey bars. Cliff faces will be climbed using free-climbing inspired animations and natural cracks and fissures. On the ground, so called “stalking zones” have been added, regions of the level where walking slowly will automatically duck you down to slink unseen among bushes and weeds. Even after seeing the stalking and climbing in motion, it remains astounding to me that it was occurring in real time. An assassin on a branch, above an army with pointy things pointing at him. This could go either way. Some non-gameplay-affecting flourishes were added to the engine as well, such as what they call “Real time Reactive Animations”, AKA flinching. And Connor will have plenty to flinch about, because for the first time, he’s not just dealing with guards, he’s dealing with soldiers. That means two things: Tactics and Numbers. In terms of tactics, you’ll see attacking soldiers assume firing lines and other group combat training. In terms of numbers, whereas previous games topped off the on-screen population at around 250, the developers say this new engine can handle as many as two thousand. The Bunker Hill scene we were treated to stretched across a sprawling field and featured squads of soldiers on both sides aiming and firing, while those in reserve moved into position or mustered their courage with the ever-popular “don’t fire until you see the whites of their eyes” speech. 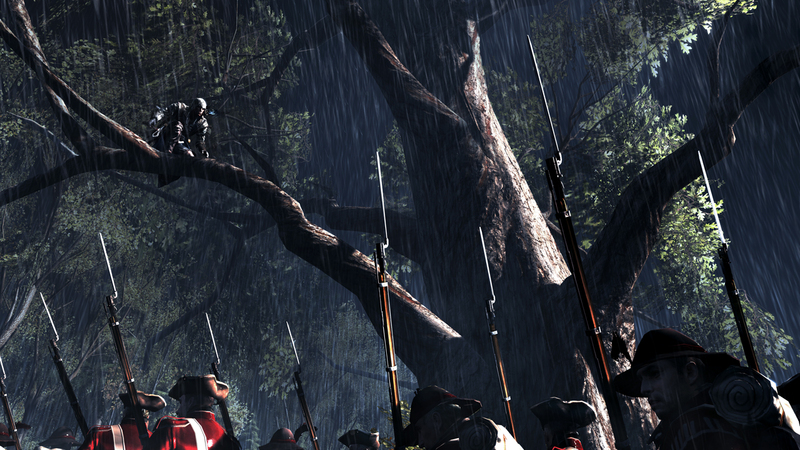 Dealing with dozens of rifle-bearing soldiers necessitated a few changes in tactics for Connor. It doesn’t matter how good you are, dodging a salvo of musket shells is going to take a little more than awesome parkour skills. Fortunately, guns are only useful at medium to long range, and guns of the era can only fire once before needing to be reloaded. To absorb that one shot, Connor can employ a hapless victim as a body shield, and to make sure there isn’t anyone around to reload and fire again, a large portion of his combat system is designed around maintaining momentum. This includes the new “running assassination”, a sprinting stab and dash that offs your enemy without even breaking stride. Dual-wielding combos also take down foes quickly, even in groups. If we weren't meant to use a tomahawk and a pistol at the same time, we wouldn't have been given two hands. The video, though supposedly a work in progress, looked slick and polished, so one can only imagine how good the final game will look when it is released on Oct. 30th. If you like, you can preorder now, and earn yourself a t-shirt or steel case for the game.